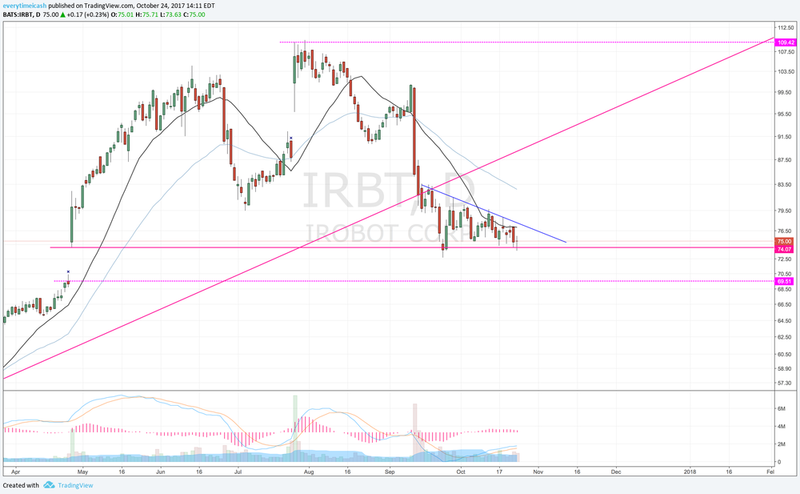 IROBOT (IRBT) is scheduled to report 3Q17 results after the close today with a conference call at 8:30am EST Oct 25th. Capital IQ consensus calls for EPS of $0.51 ($0.70) on revenues of $204.5 mln (+21% Y/Y). Last quarter, IRBT beat two-analyst estimates for both EPS and revs and raised FY 17 guidance. On September 13, Spruce Point came out w/ more cautious commentary on the co. The report highlighted the entrance of SharkNinja into robotic vacuum market. From a technical standpoint, the stock is broken. Looking for the 60 range for a potential bounce. If you want to front run it look for resistance at 83.